Today, we are highlighting The DREAM Program Inc; which is located in three regions (Boston, Vermont, and Philadelphia). Jay MacFadgen, the Program Director of the Philadelphia region, oversees and supports the four Philadelphia mentoring sites. Recently we spoke with Jay to learn more about DREAM Philly. What is the Mission of The DREAM Program Inc, and how is it filling a need in the community? The mission of The DREAM program is to build communities of families and college students that empower youth, from affordable housing neighborhoods, to recognize their options, make informed decisions, and achieve their dreams. Through our village mentoring model, The DREAM program is filling a need by providing children access to role models who can assist them in gaining opportunities and help empower them to make constructive decisions. What are the program specifics? Who are the mentors, mentees, and how is the program structured? The mentors in our program are local college students ages 18-24, and our mentees are children from affordable housing communities. They meet weekly, in both their communities and on campus from 4-6pm, on what we refer to as DREAM Fridays. The DREAM program operates on a village mentoring model; recognizing the importance of providing our mentees with a well-rounded and supportive environment, we enlist in the involvement of their parents along with one-to-one and group mentoring. Through this practice we are creating the best possible environment for our mentees to DREAM big! How many mentees did DREAM Philly serve last year? Last year 107 mentees were served. What is one success story from your program that you are proud of? Shakoya started with DREAM Philadelphia almost three years ago. She has grown from a shy young teenager to a confident young woman. During her time with DREAM, Shakoya’s leadership skills have developed exponentially; she has participated in our Mentor-In-Training (MIT) program, and is now a mentor at our Fairhill site. Our annual College Road Trip motivated her to pursue higher educational opportunities—something she had not seen in her future previously. Shakoya is a shining example of what a young person can achieve when they are surrounded by a strong and supportive community of peers and role models. Where do you see DREAM Philly in the future? DREAM hopes to serve more communities as we grow. 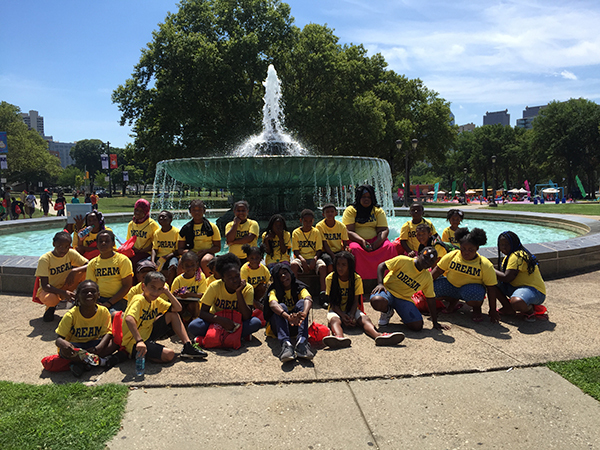 Our goal, in the next couple of years, in addition to serving more youth in Philadelphia, is to reach communities in Chester, PA, Camden, NJ and eventually, Baltimore, MD. For more information about The DREAM program, please visit their website, Twitter, and Instagram pages.